The best part of my project to read some of the best books ever written is finding completely new authors. 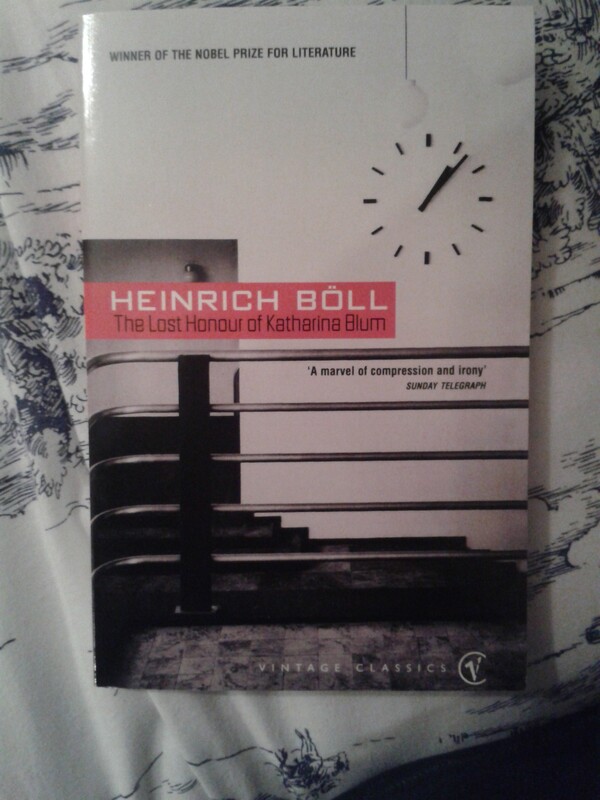 I’d never heard of Heinrich Boll or this novel before adding it to my Library list. Reading a book with no expectations can have startling effects. Like A Room of One’s Own, I read this novel in a few days. It’s gripping almost throughout, with only a slight middle-act sag. Much of this comes from the unusual structure that leads with the conclusion, leaving the rest of the novel to catch up to where we began. In another writers hands, this could have fallen flat, but Boll crafts incredible suspense and intrigue along the journey. His greatest achievement in Katharina Blum is taking the reader more than a mile in Katharina’s shoes. The book is a reflection on the power of tabloid journalism and its power over what we believe. It follows a series of events in the life of an ordinary women taunted and hunted by the media. Short and sharp, its criticism of reported news (and the people who report it) has grown in power as the breadth of the media has expanded in recent years. I hope that this book is required reading on any journalism course it captures the power of the pen by unfolding a personal tragedy and reminds us that every tabloid story has a real human at its heart. A quick and gripping read, this isn’t a challenge like many classics. You can read Katharina Blum in a single sitting if you wish. Its deep and dark and clever, but it never pretends it shouldn’t also entertain. This is also a good book to read if you’re interested in modern journalism and the power of the press. If events like the Leveson Enquiry and the Snowdon Leaks have caught your eye, you’ll learn a lot from Katharina Blum. Bolls use of a reporting style, acting as sources to the reader, helps to retain trust and authority in the story. Using Katharina would have raised questions over reliability and have an omniscient narrator would have conflicted with the theme of the novel. Opening with the conclusion and then leading back to it is a genius method of highlighting the theme of the novel the corrupting power of the tabloids. This isn’t a book about a single event, but the many small events that lead to it. A great example of a way a theme can appear in structure as well as text. Despite its age, Katherina Blum has perhaps never seemed so apt as it does today. As Lisa Hill points out in her 2008 review of the novel, the free press can in some circumstances be just as dangerous for the individual as a censored one. The Lost Honour of Katherina Blum is one of Le Monde’s 100 Books of the Century. Heinrich Boll was born in 1917 and won the Nobel Prize for Literature in 1972. One of Germanys foremost post-war writers, Bolls most famous work remains Katherina Blum. Boll died in 1985 at the age of 67.